I always have a dilemma when I go on holiday as I quite like to simplify my skin care regime but simultaneously I want to retain the benefits of my Environ products at a time when my skin probably needs it the most. Environ don’t do travel sized products which is a shame and I wouldn’t want to decant some of the products as they are in pump dispensers which keep out the air and preserve the active ingredients. I don’t mind decanting cleansers and toners as these are less sensitive. I take my usual cleaner and toner (I use the Mild Cleansing Lotion £32 and the Botanical Infused Moisturising Toner £34 from the Skin Essentia range) and decant them into smaller containers. I take my Dual-Action Pre-Cleansing Oil £19.95 again part of the Skin Essentia range) not an essential but I just like it so much plus it comes in a small neat (100ml) container. Instead of taking my Skin Essentia AVST 5 which is in quite a big container I take the A, C & E Oil £41 from the Body range. This comes in a smaller container (100ml) and you can use it on both the face and body and that’s exactly what I do. Its very concentrated and a little goes a long way! the A, C & E Oil has the same levels of vitamin A as the Skin Essentia AVST 4 or the Youth Essentia Vita-Peptide 4 so you would not be able to use it on your face unless you had reached this level. You could still use it on your body as it generally tolerates Vitamin A better. I top up my vitamin A levels with a Retinol Serum £41 from the Intensive range which I put on my face am and pm before the body oil. The serums cannot be added in to your regime until you have reached Skin Essentia AVST 5 and there are three different levels 1, 2 & 3. On my body I use A, C & E Oil after I have showered in the evening as a moisturiser and after sun repair. I sometimes use it again in the morning (if I remember) before applying my suntan cream. 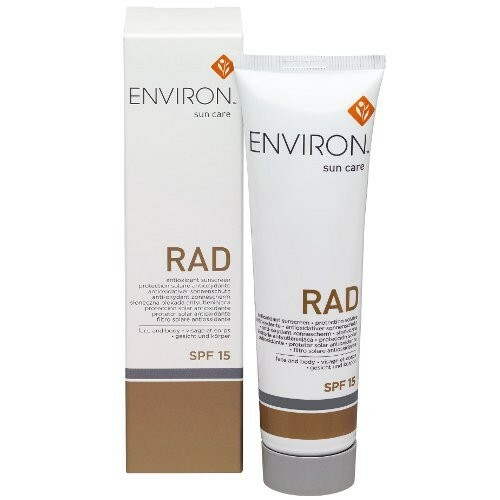 This brings me nicely onto Environ RAD £19.95. This is predominantly designed to apply to the face on top of the Environ AVST moisturisers which do not have an SPF. I use RAD on my face and body on holiday, quite extravagant I know but it does come in quite a big tube (100ml) and mostly I’m not bearing all so it may just my arms and legs. I usually supplement this with a tube of something cheaper for full on sunbathing. Finally I always take a few Hydrating Oil Capsules on holiday with me from the Intensive range £45. I always use these if I’m flying as they are great for combating the dehydrating effects of the cabin. I might use one on a special night out as they make a lovely base underneath BB cream or foundation or I may use one over night for extra moisture If I feel I’ve over done the sun. I also find that half a capsule is quite enough too which makes them last a lot longer. It would be great to hear your tips on holiday skin care regimes? ← Invite to join the pineapple challenge!